How good is raw conversion for X-trans files these days? Luminous Landscape Forum > Equipment & Techniques > Mirrorless Cameras > How good is raw conversion for X-trans files these days? Some Google searching reveals that, at least circa 2016, Lightroom's demosaicing process produced wormy artifacts (e.g. in foliage and bricks) and the application generally did poorly with X-trans files. None of the updates since then seem to have changed anything here, though I'm happy to be corrected on this point. So: have there been any image quality comparisons done with these raw converters recently (say, the last 1-2 years)? I'm particularly interested in comparisons to other 24MP crop Bayer sensor cameras where foliage or other potentially artifact-inducing subjects are present. I'm also open to any suggestions and comments you might have, as I am a relatively novice photographer. I don't do any sports or wildlife, or anything else that would demand long focal lengths or top of the line autofocus. And reviews of the Fuji bodies and lenses seem quite complimentary. I just can't get over my worry about raw conversion. Hence the request for images ("seeing is believing"). Re: How good is raw conversion for X-trans files these days? Excellent - if you use X-Transformer or C1, I think X-Trans is an advantage over Bayer. Even the latest version of Lightroom's native conversion is much improved. It is slower to convert than other formats. Most all of your worries are not present any longer, their might be the occasional lighting situation where the wormy as you call it might show up but its more of the look of the file. I have been using Iridient and it cleans the files like magic some use capture one I don't see the need. Iridient to LR to PS and maybe depending of the files Imagenonic for noise at its default. Then Topaz for detail and maybe seldom NIK (because I have other actions in PS that I like better) and you get a really clean image. Rent a X-T3 and the 56mm and go shoot a couple hundred images then you can play with the files ala trial on most platforms. The product team at Adobe is aware of the issues that you mention below and is working towards a resolution. I am not at liberty however to discuss any announced products. With your permission, I will forward your email to the product team to amplify your concerns and requests." Attached is the image I sent them, demonstrating the continued problems even with the very latest LR. I saw them with the x100f in Lightroom. Haven’t tried xt3. Regardless...I’ve stuck to the original Bayer x100. Xt2 had worms in lr. If I shotvportraits primarily it would be a non issue. But in landscape and architecture I was getting the issue constantly. C1 may be better. LR hasn’t gotten much better at all. The X-trans array gives you less color artifacts, less moiré. Due to the fact that several green pixels are positioned next to each other (instead of one pixel apart with a Bayer sensor) it results in increased bandwidth. The green channel alone is responsible for 59% of the luminance (detail) content of the image. With all due respect, I have not seen any proof of this. It seems like Fuji marketing copy and nothing more. Even if theoretically this is the case, practically speaking the current raw converters cannot realize it and all seem more comfortable with the Bayer array. Back in 2013 I used LR with the XE1 and XPro1, without any problems. I am sure if I had looked hard, say at 200%, I would see some artefacts. But I always had a light touch in sharpening, which seems to be one of the root causes of the complaints? These days I am back with using Fuji X (XPro2 and XH1), and I continue to have no problems with LR. By no means I’m falling for any kind of marketing copy or whatever. I have sufficient knowledge in sensor design and in the development of sensor based image processing pipelines, doing this for many years. The Bayer vs X-Trans test is carried out with a “Markesteijn algorithm”. How come we have never heard of this? Maybe because this very unknown algorithm might excel at some point (sharpness?) but performs below average on several other aspects (artifacts, etc). For completeness I need to say that I read a lot of nonsense in the article such as “noise reduction baked in to the X-Trans demosaicking algorithm”. Noise reduction has absolutely nothing to do with demosaicking. Another thing I read is “false color reduction of FujiFilm’s cameras comes not from the choice of sensor CFA”. False color can ONLY come from the CFA, without the CFA the sensor is monochrome and blind for any color info. There is lot’s of more BS. In the Iridient example I clearly see resolution differences where the X-Trans appear to be much sharper, when viewing at 100%. Also much better color separation. A find the image a bit oversharpened though, this should not have been necessary without still keeping sufficient detail. Fact-1: With X-trans the green pixels are positioned near each other. In theory this will give twice the spatial resolution with respect to a Bayer sensor. Fact-2: The green channel contributes 59% to the luminance channel (Y= 0.30R + 0.59G+ 0.11B). My conclusion: what comes out of the camera is anyway an image with an increased resolution. Then it’s up to the RAW converter to utilize this. We all know that previous versions of Adobe RAW Converter were underperforming in this field. I believe this has been solved in the latest releases. Additionally CaptureOne is doing a great job in getting out all details of Fuji’s RAF file while at the same time keeping aliasing under control. In the end I do think that Fuji’s X-Trans CFA is a very clever design. For completeness I need to mention that with increasing pixel quantity the additional benefits will get smaller over time, not in the last place because the lens MTF will become the limiting factor, behaving as an optical low pass filter. There's a wide range of great camera systems you can buy into now. The X-T3 is certainly among them. Use Capture One or Iridient Developer. Both are great, C1 has a decent DAM and great editing/finishing tools, ID's raw interpretation results in slightly sharper images. Avoid LR, though some say it has improved of late, I'd be surprised if Adobe weren't active here. DXO software is a non-starter, won't see X-Trans files. That's pretty well it. There's tons of reviews out there, I don't see many saying don't buy it. Also note...this is highly based on your subject matter. There are plenty of Fuji shooters using Lightroom with no issue. The artifacts complained about, the most offensive ones are only on specific kinds of patterns usually. In fact, most of the time on most general subjects the files look great. And a lot of this comes down to pixel peeping. You most likely will see none of this in print or outside of 100% mag. I would rent one and see if it works for you or not. Unfortunately it was not possible to do testing with the proprietary Fuji demosaicing algorithm, as explained in that article. There is some evidence provided (see his link) that the one used is no worse, and perhaps better, than the Fuji algorithm. (I would have liked to see a comparison with Iridient myself, but he gives in a another linked article a comparison of the Markesteijn algorithm with Iridient Developer, and they are virtually equivalent.) Note also that he used a suboptimal Bayer algorithm due to the limitations of DCRaw, so if anything the test contains some bias towards the X-Trans array. For completeness I need to say that I read a lot of nonsense in the article such as “noise reduction baked in to the X-Trans demosaicking algorithm”. Noise reduction has absolutely nothing to do with demosaicking. In the context of that paragraph, it is clear he is talking about the entire Fujifilm in-camera image processing system. Another thing I read is “false color reduction of FujiFilm’s cameras comes not from the choice of sensor CFA”. False color can ONLY come from the CFA, without the CFA the sensor is monochrome and blind for any color info. There is lot’s of more BS. Again, he is clearly discussing in-camera processing. I see a lot of Adobe samples and then a C1 noise test. We have already established that LR/ACR should not be used with X-trans files, so the Adobe samples are uninformative. And noise is not really my concern. So I am not sure what this link is supposed to show. I agree the X-Trans array is a nice idea. Unfortunately I have not seen these theoretical benefits borne out in practice. And there are very real practical downsides, including not being able to work in LR if optimal image quality is the goal, or if one wishes to disable to the built-in lens corrections. Strangely, none of them really talk about the raw conversion issue in depth, which makes it hard to have faith in them. This seems just as important as the sensor and available lenses from the perspective of image quality. Yeah, I am leaning this direction. It may be a compromise I can live with (just like every affordable lens ever...). I've been pretty much all-Fuji since 2013, and have stuck with Lightroom the whole time. 80% of my photos are fine using the Lightroom processing. The rest I send to the Iridient X Transformer from within LR, and they come back as DNG files which I can then process just like any raw file. The Iridient process does a better job with very fine detail as one might find in landscapes. I've not seen any recent comparisons of raw converters -- LR hasn't changed in years, and I don't expect to see any serious comparisons until Adobe brings out some sort of improvement. Which, ya know, they ought to do at some point. 80% of my photos are fine using the Lightroom processing. The rest I send to the Iridient X Transformer from within LR, and they come back as DNG files which I can then process just like any raw file. The Iridient process does a better job with very fine detail as one might find in landscapes. I've been Fuji since the X-T1 and now have an X-T2. After taxes are calculated this year I hope to have enough left to move to the X-T3. My experiences with the X-T1 and Lightroom weren't bad once I found that sharpening couldn't be performed in the same manner as I could with my Canon cameras. Once I got the X-T2 I was pretty discouraged by any shot that had a lot of detail in it in Lightroom. That's when I started looking around and went first with Iridient Developer and then Iridient Transformer for demosaicing the RAW files that required good sharpening. Adobe worked with Fuji on improving their demosaicing according to reports and its seems better with regards to sharpness but its still doesn't compete with Iridient in my experiences. Thomas Fitzgerald has some good ebooks on Iridient and Fuji RAW that helped me get going. I'm also open to any suggestions and comments you might have, as I am a relatively novice photographer. 1) Buy the XT-3 and use the included Capture 1. It's an outstanding camera and well reviewed by every publication for a reason. I use Iridient X-Transformer to convert my Fuji files to DNGs, which I then use with Adobe Products. Adobe Camera Raw does a very poor by default. Because the issue is largely dealt with a long time ago. Fuji's IQ is a key selling point. Maybe you should search older model reviews. If you're uncomfortable with what you're reading already, there's some excellent Nikons out there or Sonys if you want mirrorless. and download both raw and JPEG test images for the X-T3 and see how they are rendered by whatever raw converters you currently use or are considering adopting for an X-Trans workflow. I shoot with an X-H1 and have have best results with CaptureOne and Iridient Developer. I shoot with an X-H1 and have have best results with CaptureOne and Iridient Developer. 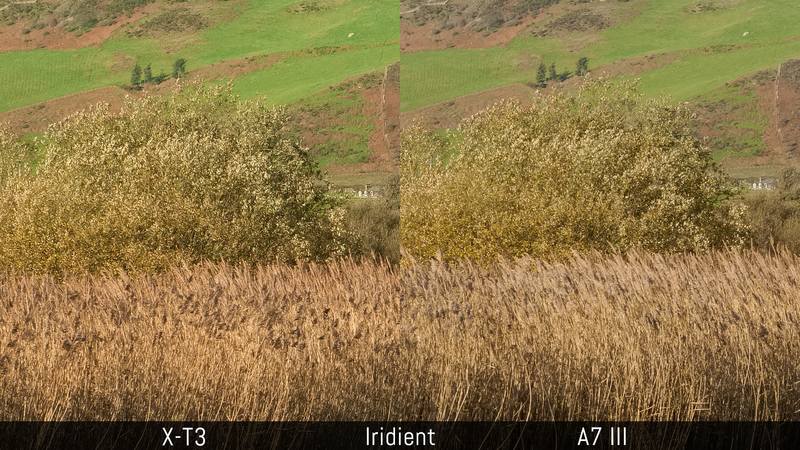 I tried Iridient and found that the results were sharper but otherwise no different than the results from LR. I prefer to control my own sharpening. I shoot a lot of landscapes with an XT2 and have never seen worms. I know that is not in line with internet chatter, but it is my experience.